Kibakichi reminded me of Nightbreed (1990) in a lot of ways, with a man/monster deciding whether to put his life at risk for other monsters who are being threatened by humans. 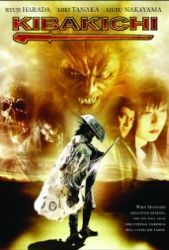 This is much of more of a samurai film then a straight-up horror film, although there are some gruesome scenes and some inventive looking creatures. The final third becomes all out action with a wolfed out Kibakichi leaping around and tearing arms off of bad guys amidst a hail of gunfire. There was even some monster suit wrestling which was giving me War of the Garganutas (1966) flashbacks. There is an air of tragedy that hangs over the film, which tempers the more outlandish moments, but it was still an unusual and interesting take on a werewolf story.